We did it. 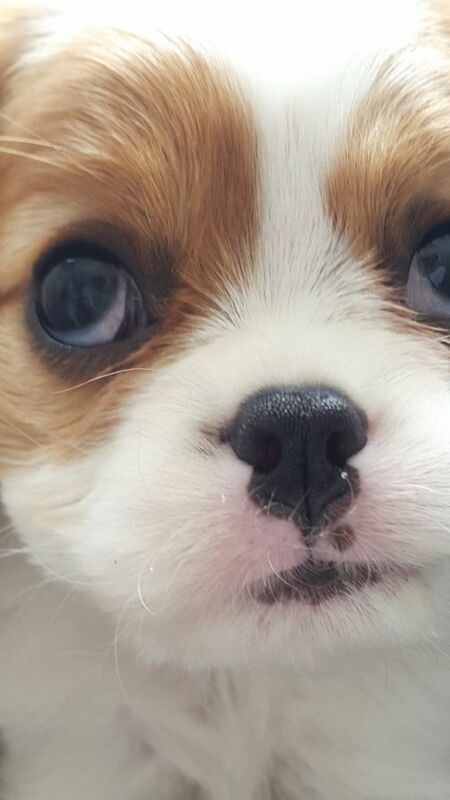 We got a dog. Welcome Miss Piper. She is just 8 1/2 weeks old. Just a little thing. If you have been following along on Instagram, you can get a taste of how much we love her. You will see this little face in my IG feed for a while. Maybe even forever. I have gone back to my four-year-old self when I used to drag my cocker spaniel, Ginger, around like a rag doll and dress her up (I even painted her nails). Although we are not dressing this dog up (nor dragging her around), we sure are having fun with her and she is training very well considering she is a pup and chewing the bottom corner of my dishwasher as I type. I have to type in the kitchen at the counter or she chews on the cord. We are crate training and doing things by the book, and it is working! She has learned her crate/den is a good place and sleeps most the night, as long as she can "hold it" until about 4 am. I think that is pretty good for a pup, don't you? While waiting for Piper to be weaned, I had some time to scour the internet for my favorite stylish dog sources and ruff stuff. Here are my top picks! Wow, there's a whole dog world out there that I never knew about! I could do another post on best dog beds alone, but here's a starter list fo you to check out my personal favorites. 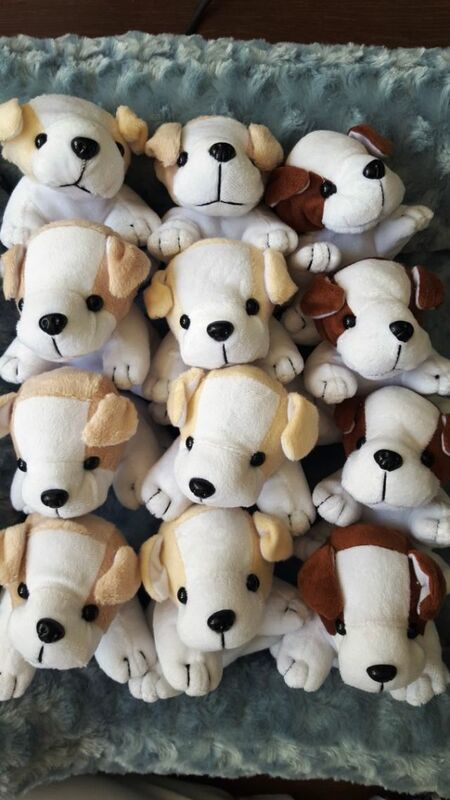 Party pack of 12 plush dog animals can be found here. Wee Miss Piper. She may be little, but she runs like lightening. We could not have asked for a better puppy. Eden is very afraid of dogs, all dogs, and after 2 days with Piper, she is picking her up on her own. I was the same as a child, I was bit, and didn't want to go near a dog. Eden was at the point of screaming and hopping up in my arms if she saw one coming. It was becoming stressful at friend's homes with dogs. So, we decided, we'd better get one that we could train, to help counter that fear. My parent's did the same with me, and it worked. I am still a little shy of some bigger dogs, but I understand them better after growing up with 2. My husband has had over 20 dogs in his life, he is very familiar! She prefers a stick over a ball, and my sons socks...just his socks....and feathers, and leaves, and flower head, so we have to watch really closely or she could get sick. 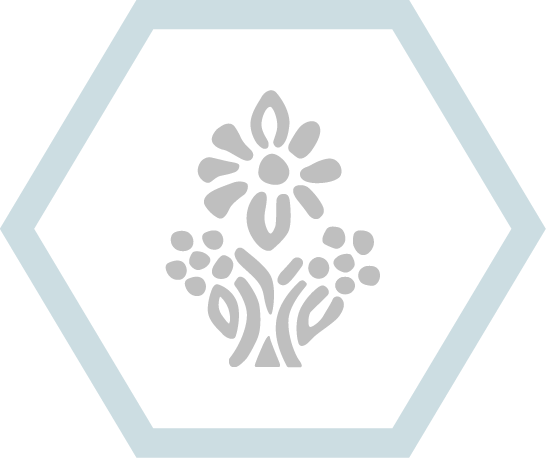 Peonies are on the toxic to dogs list, oh no! She hates my electric toothbrush-she thinks it is hurting me, and the broom, but found the vacuum to be interesting. Just like a newborn, she sleeps alot. In fact, she is sleeping while I am writing this. Tristan is on his way to feeling whole again after losing his beloved cat, Hailey. After her first bath with Eden. This breed loves to burrow and cuddle. Dog beds all over the house not that necessary, as "you" are their bed. We just got back from a trip to the panhandle area in Florida (30A-another blog post coming up) and Eden turned 7 there. We celebrated with a little party when we got back with 6 of her friends. She had asked for a Puppy Party (Pawty). Of course! I made Puppy Chow (for people) deliciously addictive. See my instagram feed for the recipe and directions! We also had corn dogs, corn on the cob and fruit for dinner. I didn't have time to scout the town for a person who could make a Cav cake, so I winged it. 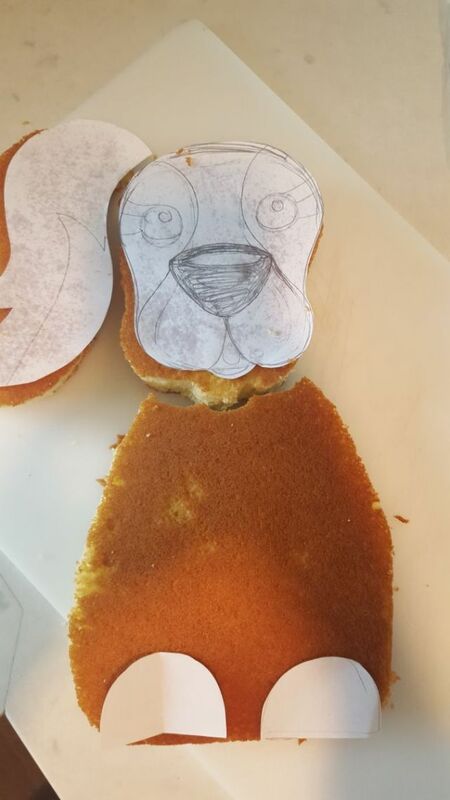 I drew a dog, cut the template apart, and placed it on parts of two baked 9x13 baked cakes. I made some home made butter cream frosting,purchased brown fondant and got to work. I dyed a small portion of frosting black and piped it on. Peanut Butter cookie mix, with a little added flour upon cutting, makes these dog bone cookies look like real dog biscuits. For Peanut sensitive kids, oatmeal would work great too. 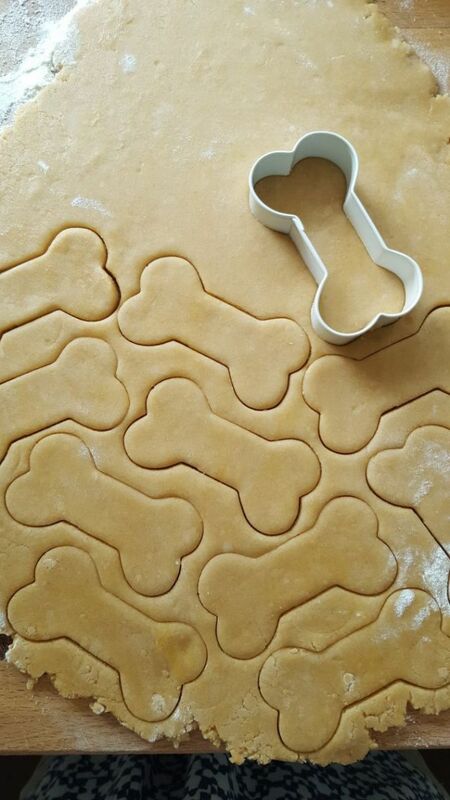 The cookie cutter is by Wilton and comes in three -silhouette, paw and bone. I found a 12 pack of dogs from Amazon (see Resources) and the girls could choose which to adopt. We also played pin the tail on the Cav. A simple game, I thought, that lasted 5 rounds! They had fun spinning one another around.